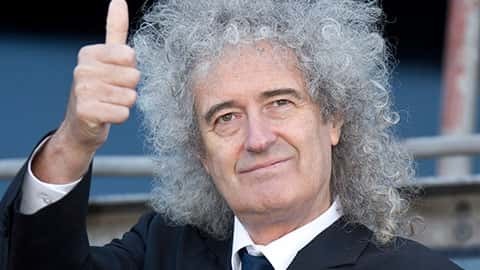 Dr Brian May, CBE, PhD FRAS, is a founding member of Queen, a world-renowned guitarist, songwriter, producer and performer, also a Doctor of Astrophysics, 3D stereoscopic photographic authority and a passionate advocate and campaigner for animal rights. As an accomplished Astronomy student working towards a PhD, Brian put his academic studies on hold when Queen’s popularity first exploded. Over the following four decades the band enjoyed worldwide success with a musical catalogue that consistently tops popularity polls and sees Queen remain the most successful albums act in UK chart history. Brian has penned 22 of Queen’s top 20 hit singles including “We Will Rock You”, namesake to the worldwide hit ‘Rock Theatrical’ written with Ben Elton which has now been seen by over 15 million people in 17 countries. Also an established sports anthem, the track was declared the most-played song at American sporting events (BMI) and reportedly played over 550,000 times during the London 2012 Olympic Games. The Games Closing Ceremony saw Brian making a solo appearance wearing a jacket embroidered with emblems of British Wildlife; he then launched into “We Will Rock You” with Roger Taylor and guest Jessie J, viewed by a TV audience estimated at one billion. A comparable iconic global live appearance was Brian playing his own arrangement of “God Save the Queen” from the roof of Buckingham Palace to open HM The Queen’s 2002 Golden Jubilee celebrations. With a great love for live performance, having played over 700 concerts with Queen, in 2004 Brian and Roger celebrated Queen’s induction into the UK Music Hall of Fame by performing with former Free/Bad Company vocalist, Paul Rodgers. A triumphant 55-date world tour with Paul as guest vocalist followed, the first Queen tour in 20 years, along with the studio album The Cosmos Rocks, supported by a second world tour and the release of two live DVDs and a live album. 2012 saw a return of Queen onstage, this time with guest vocalist, Adam Lambert, a partnership, which delighted fans and critics unanimously. As an accomplished solo artist, Brian toured his highly successful albums – 1992’s Back To The Light, featuring “Too Much Love Will Kill You” and “Driven By You”, both Ivor Novello Award winners, and 1998’s Another World. No stranger to the theatrical world, Brian wrote and performed the music for the 1987 and 1990 productions of Macbeth at The London Riverside Studios and he has regularly contributed to the live performance work of his wife, Anita Dobson. Brian delved into the world of film scoring when Queen became the first rock group to score a major film, Flash Gordon. Definitive music for Highlander followed, an opera for Steve Baron’s Pinocchio, and a complete film soundtrack created by Brian for the 1999 French art film, Furia. He has contributed to a number of soundtracks including The Rocky Horror Picture Show, Mission Impossible II and Spiderman II. Further credits, to numerous to list, include writing themes for several TV shows, remixing Queen recordings in 5.1 Surround Sound and designing a Planetarium show in Belgium and Germany. Brian is proud to be an ambassador for the Mercury Phoenix Trust, the charity set up in memory of Freddie Mercury, which has channelled over $15 million to support global AIDS projects. Their commitment to AIDS awareness led to Queen’s driving involvement in the 46664 campaign, alongside The Nelson Mandela Foundation founded in October 2003, with concert performances in South Africa and London. Brian also performed with Armenian Duduk player, Jivan Gasparyan, in the 2005 extraordinary 46664 ARCTIC concert in Tromsø, Norway, 200 miles inside the Arctic Circle. Brian’s songs and distinctive guitar style, produced from his revered homemade ‘Red Special’ guitar using a sixpence as a plectrum, continue to inspire a diverse genre of international artists. His wealth of guest contributions range from playing on Michael Kamen’s 2002 Winter Olympics theme, to producing the No 1 Comic Relief hit, “The Stonk”, and, most recently, recording and performing both with Lady Gaga, and with Dappy on his recent hit, “Rockstar”. Brian’s creative forces continue, partnering co-star, Kerry Ellis with whom he wrote, arranged, performed and produced Kerry‘s stunning 2011 debut album,Anthems. Brian and Kerry’s second UK tour, which celebrated the release of their version of the single “Born Free”, took a departure from their larger scale Anthems tour, to favour an intimate acoustic evening with Kerry singing and Brian accompanying on both guitar and vocals. This year Brian will continue to play tour dates in aid of Virginia McKenna’s Born Free Foundation with Kerry – the original creator of the role of Meat in Queen’s Rock theatrical “We Will Rock You”. May and Ellis are currently working on the follow-up to the successful ‘Anthems’ album released in 2011. As a lifelong advocate of animal welfare, Brian set up the Save Me campaign, named after his song, to champion all, but predominantly British, wildlife. Save Me works at grass roots level in conjunction with a local animal rescue and re-homing centre as well as being a player alongside the major animal welfare groups. Brian has been a leading inspiration in the fight against fox hunting and the ongoing fight against the proposed UK badger cull and his work led to him recently being awarded the honour of “Campaigner of the Year” by IFAW, the International fund for Animal Welfare. This work continues through the Save-Me website which can be found at www.save-me.org.uk, also at www.teambadger.org. Brian has always retained his keen passion for Astronomy and in 2006, after a 30-year break, he returned to Astrophysics and his doctoral thesis. Already the recipient of honorary degrees from the Universities of Hertfordshire, Exeter and Liverpool John Moores, upon submission of his updated thesis on the Motions of Interplanetary Dust, Brian achieved his full PhD degree from Imperial College, London, in 2007. He subsequently accepted a post of Visiting Researcher to continue his work in Astronomy and following a 5 year post as Chancellor of Liverpool John Moores, Brian now holds the honorary position of Chancellor Emeritus. 2006 saw Brian co-author his first book, Bang! The Complete History of the Universe, with Sir Patrick Moore and Dr Chris Lintott. This illustrated astrophysics book, now been published in 20 languages, was followed in 2012 with the release of a greatly anticipated sequel, The Cosmic Tourist. Another long-term interest in 3D Photography led to the publication of Brian’s second book. Co-authored with Elena Vidal, A Village Lost and Found is an authoritative study of the work of master 1850s stereo photographer, T R Williams, complete with an OWL stereoscopic viewer designed by Brian himself. He is currently co-authoring a book on French Diableries, due for publication for Halloween 2013. More information on this and all matters stereoscopic are available at Brian’s dedicated website, www.londonstereo.com.